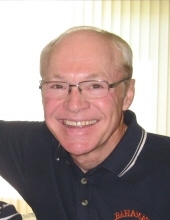 Byron D. Bong, age 70, of Ames, passed away on March 26, 2019 at Northridge Village in Ames. A memorial service will be held at 11:00 A.M. on Friday, April 5, 2019 at Cornerstone Church in Ames. Visitation will be held for two hours prior to the service at the church. An additional memorial service and burial will be at a later date in Minnesota. Funeral arrangements are under the direction of the Adams Funeral Home and online condolences may be left for the family at www.adamssoderstrum.com. Memorial contributions may be directed to the family which will be given to charities of Byron’s choice. Born on April 6, 1948 in Fairmont, MN, Byron was the son of Irvin and Florence (Sternberg) Bong. He graduated from Kennedy High School in Bloomington, MN in 1966. He then went on to receive a Bachelor’s Degree in 1970, Master’s Degree in Education in 1975, and did post-graduate studies, all at the University of Minnesota. Byron was united in marriage to Carol Peterson on July 11, 1970 at Redemption Lutheran Church in Bloomington, MN. He had a special love for education and especially children. Beyond his legacy of guiding impressionable elementary school minds for over 40 years as an educator in the Burnsville-Eagan-Savage school district in Minnesota, possibly his greatest legacy was raising his children and grandchildren in a steadfast and unwavering belief and conviction in the love and forgiveness found only in a relationship with Jesus Christ. Byron lived life gracefully and enjoyed many activities including: playing card games such as 500, Cribbage, and UNO with his grandchildren; tennis; hunting when afforded the opportunity; was a devoted Minnesota Vikings and Twins fan; and although he’d be the first to admit he wasn’t very good at it, he enjoyed playing golf. Byron also refereed Minnesota high school girls’ basketball for many years. Byron and Carol moved to Ames in 2014 and called Cornerstone Church in Ames home. Byron was a man of strength and integrity, gentleness and grace, kindness and love. His legacy continues in his children and grandchildren. Byron is survived by his wife, Carol; sons: Brandon (Danielle) Bong of Savage, MN and Nathan (Jackie) Bong of Ames; twin grandchildren: Logan and Ryder of Ames; a sister, Beth (Bruce) Janohosky; and a brother-in-law, Dale (Debbie) Peterson. He was preceded in death by his parents; a son, Aaron; and a sister, Brenda. To send flowers or a remembrance gift to the family of Byron D. Bong, please visit our Tribute Store. "Email Address" would like to share the life celebration of Byron D. Bong. Click on the "link" to go to share a favorite memory or leave a condolence message for the family.